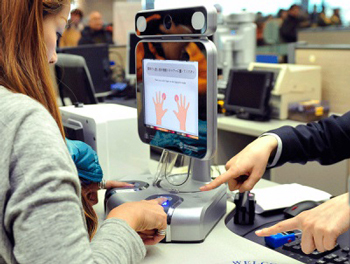 Foreign visitors entering the Republic of Korea now go through an immigration clearance process that features SMARTCORE multi-biometric acquisition stations (MBAS) with Lumidigm multispectral imaging sensors. Upon arrival to Korea’s busiest airports and seaports, all foreign visitors proceed to Korea Immigration stations and submit their arrival card and passport to the immigration officer. They then place the index fingers of each hand on the two Lumidigm fingerprint sensors for simultaneous fingerprint verification. The MBAS also photographs the face of each visitor during the transaction. Manufactured by SMARTCORE, a leading image processing and immigration solutions provider in South Korea, the MBAS is an ergonomic, integrated unit that captures both facial and fingerprint data at the Korean immigration stations. It minimizes imaging time and acquires high-quality biometric data. Because the fingerprint sensors use multispectral imaging technology, the MBAS is able to read fingerprints on the first try. Multispectral imaging collects information about both the surface and subsurface fingerprint to capture reliable data, regardless of whether a user’s finger is dry, wet, dirty, slightly rotated, or difficult to capture. Data is captured on the first try every time, allowing tired travellers to enter the country as quickly and easily as possible.